EVERY little girl dreams of a fairytale wedding. And so it was for John Ferguson's little girl Alisa. 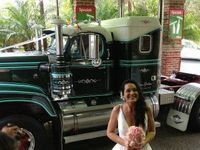 But instead of riding on a white horse, this little girl was the daughter of a truckie and for her wedding recently she rode in a 1967 Diamond T that her father has restored. John rebuilt the truck, a model P5000, over a 19-year period while he was working it from one end of the country to the other. "My old Diamond T...Such a reliable truck," he reminisced. "When I took the rebuild to the next level, I would pull her off the road for a month or so, until the addition was complete." John bought the truck back in 1976 and over the years lengthened the chassis and transformed short wheel base single drive to a Hendrickson 60/40 walking beam lazy axle, added a sleeper cab, custom tilt bonnet, bigger engine and transmission, aluminium long range fuel tanks and much more. When it came time to sell the truck it was difficult for the family. "It was a hard decision to sell her and I called a family meeting and asked my wife and three daughters for their permission as it was a major part of their lives too. "They told me that they trusted me to do what I thought was right and that they loved me and would accept my decision." Even so they all cried when he sold her. "My eldest daughter Alisa cried for a week and never really got over it and I must admit that I also had a tear in my eye at the time." The truck was sold to a good friend of John's, Tony Budd from Cornubia in Queensland, in 1995. "Tony worked it for about two years and when I heard that he was thinking of selling her, I introduced Tony to another good friend who had said to me, 'Bloody hell John, why didn't you let me know you were going to sell her, I would have bought it, so if your mate ever decides to sell her, make sure you let me know'." But that's not what makes this story so special; it's that the Diamond T came back to the family for one special day. 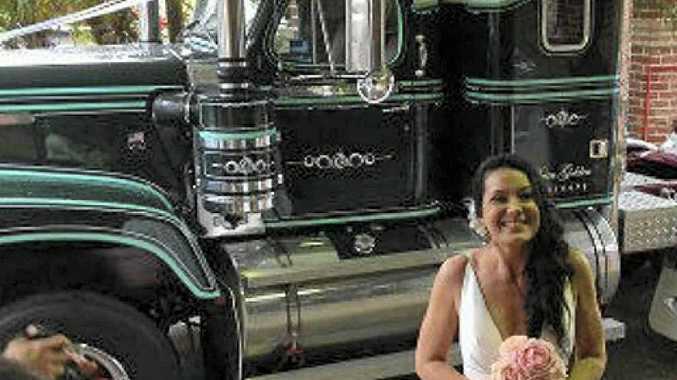 John's eldest daughter Alisa was due to be married to her beau, Adrian O'Brien, in November and she had hoped that John's new truck, which he was restoring, would be ready to be used as the bridal car. Sadly it wasn't going to be finished and Alisa gave up on her dream of being driven in her dad's truck to the wedding at Valla Beach in NSW on November 10. But unbeknownst to her, dad and her sisters had another idea. John told Big Rigs that the idea came when Alisa's younger sister Becki looked at an old picture of the Diamond T and suggested he get into contact with the new owner, Dean Golden. Luckily Dean was more than happy to donate the truck for the day and let John drive it. "When the Diamond had arrived, Alisa's face said it all; she went into shock, followed by tears, yes from me as well. "Ali just couldn't believe it. My wife Christine and I, along with our other two daughters Becki and Cathie, as well as friends, Sam and Katie, all of whom were Ali's bridesmaids, will never forget that moment when Alisa heard her beloved Diamond T coming down the road! "Even though 17 years had past since she had heard the sweet sound of that Detroit engine, she knew it was her Diamond T before she had actually seen it. "That moment was priceless, as I'll never forget the look on her face." John said it was a true fairytale for his daughter. "Christine and I are very grateful and would like to thank Dean and his wife Kylie for making this momentous occasion possible and wish to let you know that the newlyweds were in awe and amazement, they also thank them from the bottom of their hearts! John Ferguson said his daughter Alisa was always the first to greet him after long trips away on the road. She would fill him in on what he had missed while away. "As she was more or less conceived in this truck, Ali could hear the truck coming from miles away; the Diamond T was a major part of her life! "I decided to stop doing long distance driving when my children were young so as I could be home more often to watch them grow. "My wife and I were born and bred in Sydney and at the time we had thoughts of moving to the mid-north Coast of NSW to give our daughters a better way of life." Twenty years ago they decided that it was now or never, and bought a beautiful property in the Nambucca Valley, half way between Sydney and Brisbane. "One of the first things I had to come to terms with was the reality of having to go back on the highway and doing long haul as there wasn't a lot of local work about. "After running up and down for a few years, I knew I had outgrown our beloved Diamond T.
"And the only way to keep doing what I loved best was to let go and sell her." When Dean took over ownership the truck was back on the mid-north coast of NSW. "I'm so fortunate to have a good friend and fastidious man, much like myself, own and take pride of my old girl the Diamond T.
John now has a new project and has started the restoration process all over again with a classic 1985 W924 Kenworth, which he still operates now. "I've restored this beautiful W model and have owned it for 17 years".